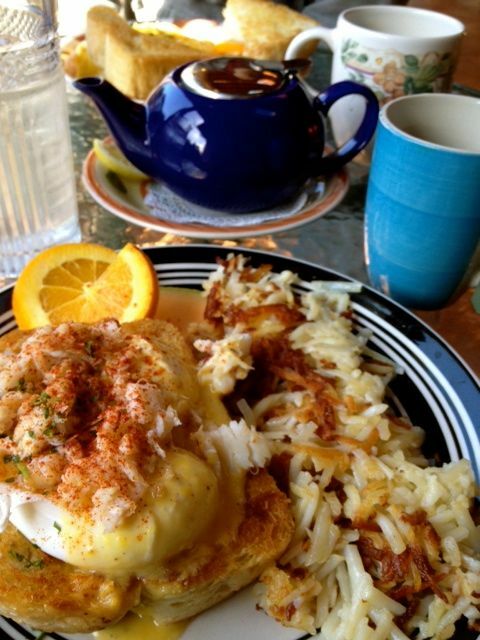 Crab Eggs Benedict from Wildflower Grill in Lincoln City. Look at the toast at the top of the picture to see how thick it is. They took us to the back which was a glassed in area over looking a pond. Just a quiet peaceful place to eat. We quickly placed our order and waited. They brought out my tea in a little tea pot and my tea cup was so hot you could barely touch it. At this point, the food could have been awful and I would have been in love with this place. Nothing I hate more than cold tea. Needless to say, my tea never got cold, it was perfect! After we ordered we saw someones food come out and they ordered the french toast. The slices were thick. My husband quickly regretted not getting the french toast. 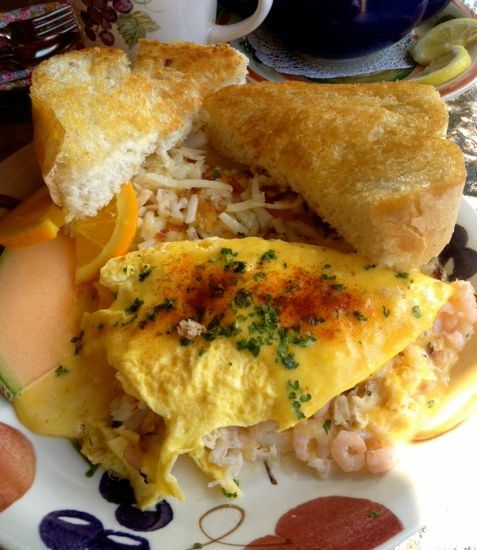 Seafood Omelet. Loaded with tons of seafood, they did not skimp. The regret came to an end once our food arrived. You know what I got….The Eggs Benedict with crab. The crab was plentiful, the hollandaise was perfect and not too much and they eggs perfectly poached. This all sat on top of a HUGE piece of toasted bread. The pictures don’t do it justice. It was about 2 inches thick. Personally it was way to much bread for me. So I picked around it and made it work. It was still delicious. My husband ordered the seafood scramble with crab and shrimp also topped with a hollandaise sauce. It was loaded with seafood and also very good. His dish came with toast, the same 2 inch thick slices that I had. The gals next to us got the pancakes and they were also huge and they were ranting and raving about those. Atmosphere is very sweet in this older home with farmhouse tables and chairs. The back glassed in patio area is very bright, even on a gloomy day. Service was spectacular. The place wasn’t busy on this weekday, late morning, but they were on top of everything. We waited for nothing. Pricing was a bit on the high side. I know we got seafood, but most dishes were high. I think ours were $15 each. They served a tea I had not heard of, the coffee was from Sisters Coffee Company. The Wildflower Grill is located in Lincoln City on the north side of town. Such a great place. Has anyone ever been here and gotten the French Toast? My daughter and I ate at the Wildflower for lunch. We had salads. They were very good and very pretty. They did not come with bread which we missed. The service unfortunately was not that great for us. There were a few other tables of people one a group of 7 and the server knew them. They got really goid service. We haven’t been back. I agree they are on the high side 2 salads and no service left us with a check of over $30.00. I am so sorry. Bad service can ruin a perfectly good meal. Wildflower grill is our families favorite breakfast spot to go to when we are in Lincoln City. We look forward to it every visit. Your right the french toast and pancakes are great!